1) The defense. It was mostly reserves against reserves, and Steeler quarterback Ben Roethlisberger didn't play at all. But pitching a shutout is hard at any level, and the Panthers did so by playing good defense everywhere. 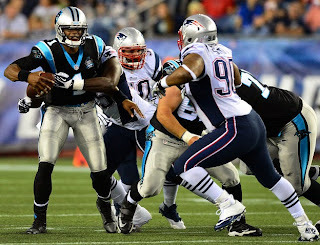 The defensive line, in particular, was very good as Carolina racked up six sacks and allowed only 185 total yards. 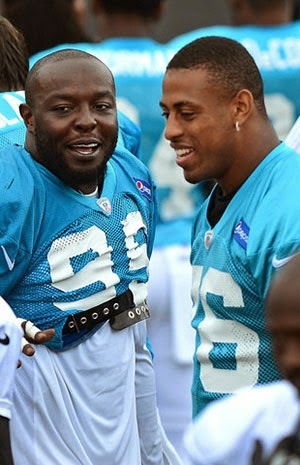 2) Joe Webb and Fozzy Whittaker. The Panthers' third-team quarterback and fourth-team running back got loads of work because of injuries and planned sitdowns. Both solidified their spots on the final 53-man roster. Whittaker ran hard, gained 91 yards and scored the game's only TD. Webb made a gorgeous, 53-yard deep throw to Philly Brown to set that TD up and showed some elusiveness. If Webb had to play in a game this year, it wouldn't be the worst thing in the world -- and Whittaker is definitely going to play at some point. 3) Dodging the big injury. The Panthers have had some nicks during the exhibitions, no doubt about that. It is impossible for that not to happen. But they never got the huge injury in four exhibitions. Derek Anderson's throwing hand got hurt Thursday, but it could have been worse (X-rays were negative, but he did have his hand wrapped up in the second half). I think Cam Newton will play through his fractured ribs in the regular-season opener Sept.7. Safety Roman Harper got his first exhibition work Thursday after sitting out much of August with turf toe. Kuechly could have played Thursday if he needed to. So the Panthers will go into September healthier than a lot of teams will. 4. The fake games are over. The NFL's exhibition season isn't endless, it only seems that way. Finally, we can dismiss these games entirely. Carolina plays Pittsburgh for real Sept.21, and before that come games against Tampa Bay and Detroit. Time for some real football. 1) No pass rush. The Panthers led the NFL with 60 sacks last season and there has been some talk about whether they could break the NFL overall record (72). Not like this -- Tom Brady's uniform never got dirty, and no Patriot quarterback came close to getting sacked. This team is predicated on getting to the passer, first and foremost -- it is why GM Dave Gettleman has spent so many draft picks and so much money on the D-line. It has absolutely got to do better, starting Thursday at Pittsburgh. 2) Rushing game. One of Panther coach Ron Rivera's favorite stats is that in 15 of 16 games last season Carolina rushed for at least 100 yards. Not this time: Carolina ran for only 63. There were hardly any holes, and the running backs didn't do much, either. No run was for more than eight yards. 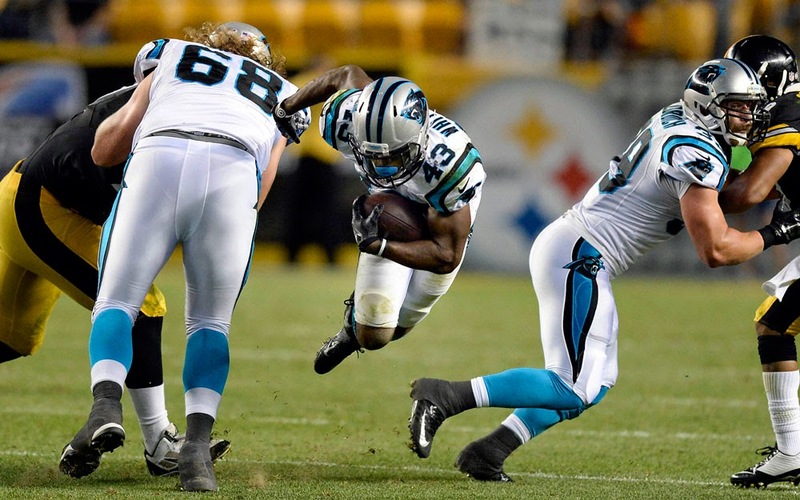 "Double Trouble" was no trouble, with DeAngelo Williams and Jonathan Stewart combining for nine carries for 20 yards. 3) Cam's back. Newton suffered a hairline fracture in a rib, which will sideline him for the final exhibition vs. Pittsburgh and puts his Week 1 status at least in doubt. The last thing Newton needs is another nagging injury to join his problematic ankle, but now he's got one after getting kneed to the back while going down trying to avoid getting hurt (Newton must learn to slide). That he got sacked three times in this game (see above pic) and pressured a lot more wasn't helpful, either. 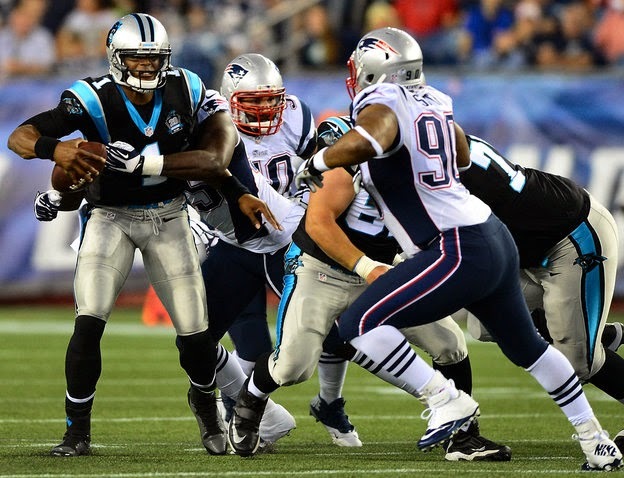 Newton ends the exhibition season with no TD passes and five sacks. Here's more of my thoughts on his injury in the column that was published in Monday's newspaper. 4) Julian Edelman. He made every Panther defensive back look silly at one time or another, and a lot of their special-teamers, too. Edelman caught all eight passes thrown toward him for 99 yards and returned two punts for 51 more. 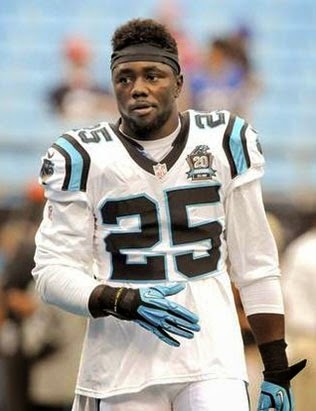 And he's not close to the best receiver the Panthers will face this season. And the Panthers better hope middle linebacker Luke Kuechly stays healthy (he has a thumb injury that won't keep him from playing for now), because when he was out the Pats ran roughshod over Carolina and made second-year linebacker A.J. Klein look silly on a wheel route that turned into a 40-yard TD. 5) The offense in general. There were a lot of things going wrong here, which is why Carolina didn't score until the final two minutes when the score was 30-0 and third-stringer Joe Webb was in the game. Other than rookie Kelvin Benjamin, it's hard to point to a bright spot. But I worry most about the Panthers' offensive line, which looked half-baked in this one. Webb will get a lot of playing time Thursday vs. Pittsburgh, and it's now quite likely he's going to make the team since the Panthers can't go into the season with 2 QBs with Newton banged up like he is. One of the least impressive players ever since training camp started for the Panthers has been running back Kenjon Barner. Supposedly very fast, Barner never broke enough tackles to show it. Undeniably undersized, Barner too often got overwhelmed in pass protection. Simply put, the Panthers' sixth round pick in 2013 was about to get cut. Had to be. And so the Panthers shipped him off to Philadelphia Tuesday night, where he will be reunited with his old college coach at Oregon (Chip Kelly). All general manager Dave Gettleman got was a conditional seventh-round draft pick, which I'd assume means that Barner has to make the team for the Panthers to cash it. But that's better than nothing. The Panthers have struggled finding another running back behind DeAngelo Williams, Mike Tolbert and the oft-injured Jonathan Stewart, but that guy may have emerged Sunday night in Fozzy Whittaker. Whittaker broke more tackles in one night than Barner has in two years. He's likely going to make this team, and Barner is going to get a fresh look in Philadelphia. That's good for everyone. I just hope Kelly doesn't expect Barner to block much, or else Nick Foles is in trouble. My very brief theory on Johnny Manziel and why he shot the bird at the Washington sideline Monday night consists of two parts. 1) Manziel is extremely immature. 2) He was not getting enough attention. Can you imagine having to coach Manziel -- or rely on him for anything -- at this stage of his life? It would be awful. Surely he will grow up one day, but the constant parade of Manziel-related negative headlines is so tiresome. The latest came Monday night, when Manziel flipped the Washington sideline off (he wasn't penalized but will likely be fined). It wasn't that terrible of a thing to do, but it was so childish. Manziel wasn't having a good game and people were yelling at him. Wow -- that's all? Welcome to the NFL, buddy. Now that people know they can get to you, how do you think it's going to be for the next 10 games you enter? As for the attention thing -- I think there is a part of Manziel that truly craves it. Why else does he show up in so many public places on his off time? I know we live in a digital age where everyone has a camera phone, but contrast how many pictures there are of Manziel doing something weird (at best) in his off time with how many there are of, say, Andrew Luck or RGIII or Cam Newton? So this was "Monday Night Football," and Manziel wasn't playing well, and this was a way he could dominate the postgame narrative. I'm sure he didn't think of it that way, but I also don't think he really minds what is happening today. There's no way Cleveland can start Manziel, although Brian Hoyer is so bad undoubtedly the rookie is going to play at some point. I don't like his chances this year, though. Manziel is a child trying to lead a group of men, and that only works if the child is very wise. Manziel is far from that. Panther rookie Kelvin Benjamin has done just about everything right so far in his very young career for the Carolina Panthers, but his obvious personal-foul penalty in the Kansas City game is worth discussing. Benjamin flicked the ball at Chiefs cornerback Chris Owens after a reception far out of bounds in the second quarter Sunday night with about 10 seconds to go. Then he shoved and head-butted Owens, taking the Panthers out of field-goal range in the final seconds of the first half. Carolina won anyway, 28-16. (Here's my column on the game). Benjamin said after the game he was "just being young. It was a mistake that I made. That’s something I’ve got to learn from." He's right about that. The last thing Benjamin needs is to develop an anger-management issue like the one Steve Smith had, especially early in his career. Sunday night should be a lesson for No.13 -- and an exhibition is the right time to learn it. Said quarterback Cam Newton, who has been Benjamin's BFF basically from the day the No.1 draft pick showed up in Charlotte, of Benjamin's mistake: "He understands. He knows. When you have an opportunity to kick a field goal right before the half.... don't put yourself deeper in a hole. As he will soon find out in this league, points are at a premium.... Don't have self-inflicted penalties that will get you out of it." I thought coach Ron Rivera should pull Benjamin off the field immediately following the play. Instead, he allowed Benjamin to stay on for the final snap before halftime. But Rivera did realize that this brief but bone-headed action by the rookie has to be nipped in the bud (he did a better job with cornerback Josh Norman, who didn't get flagged but got pulled out of the game after temporarily losing his head). Benjamin is going to be too big a part of the team to do such things. "I told Kelvin that this is going to happen," Rivera said. "A guy is going to try to get inside your head and get you to play outside of your game and that’s what we talked about. I told him that when they start doing that it’s because they know you can do some good things. You’ll learn how to handle it and learn how to be graceful about it and keep going forward." But Rivera also defended Benjamin's actions to an extent. "Hopefully he’ll get out of it," the coach said. "But this is also one of those things where you have to stand up for yourself. There’s a point where you have to draw a line and a guy has to understand that if you do this and continue to do this then I’m going to draw a line in the sand. I told him that if you want to go get back at somebody, just go make a play." The Benjamin incident reminded just about everyone of the three key personal-foul penalties the Panthers got in the San Francisco playoff loss in January. It can't happen again. I understand defending yourself, but don't do it in a way that hurts your team. Next time, Rivera should be quicker on the trigger with Benjamin if the wide receiver does so. Could Panthers break NFL sack record for a season? 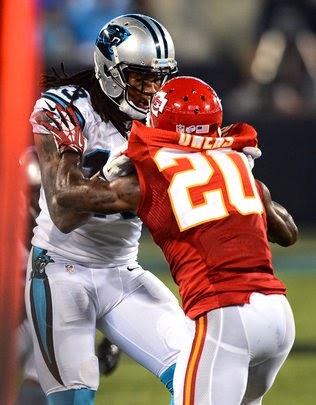 In 2013, the Carolina Panthers set a team record with 60 sacks in a single season. In 2014, is it possible the Panthers could set the all-time NFL record in the same category? One member of the Panther defense said so publicly on Tuesday, becoming the first player to verbalize the goal. "We set the bar pretty high last year, leading the league with 60 sacks," defensive tackle Colin Cole said to reporters. 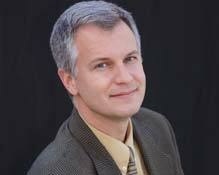 "The goal is to surpass that and see if we can't get up with the big dogs of the past years. We want to set records. We did as a franchise, we want to do it across the league." I asked Cole then if he knew what the league record was. He didn't know which team had set it, but had a pretty good idea where the target would be. "What I do know is that the overall league record for sacks in a year was somewhere up in the mid-70s," Cole said. "For us as a defensive line, that's where our goal is. And maybe that's just me talking on my behalf, but if you don't shoot for the stars, you'll never reach the moon." The actual team sack record: 72 sacks in 1984, by the fearsome Chicago Bears. That team didn't win the Super Bowl that year, but did so the next season with basically the same nucleus. Panther coach Ron Rivera was a reserve linebacker on that '84 Bears team but did not have any sacks that season. It sounds simple in one respect for the Panthers to get to 73. One additional sack per game would do it and in fact get them to 76. But in reality, this is an almost impossible goal. NFL quarterbacks throw the ball on three-step drops so often these days that even an unblocked pass rusher sometimes has trouble getting to the quarterback. Carolina would need double-digit sack seasons once again from Greg Hardy (15 in 2013) and Charles Johnson (11), but likely with both increasing their totals by at least three apiece. They would almost assuredly need a third double-digit sacker to emerge as well. And then the Panthers would need some breakout sack performances from young players like rookie Kony Ealy or defensive tackle K.K. Short, as well as enough offense from Cam Newton and company that Carolina was playing with double-digit leads in a lot of fourth quarters and piling up sack numbers that way as teams were forced to throw deep passes that made the quarterbacks hold the ball longer in one-dimensional attacks. Notice I said "nearly impossible," but not completely. This Panther defense was No.2 in the NFL last season and its front seven returns basically intact. It has loads of potential. It would be foolish to say this is completely out of the question. But 73 sacks?! That works out to more than 4.5 sacks per game. There's a reason that record has stood for almost 30 years -- 72 is an incredibly high number. Ultimately, I don't think the Panthers will get there or really get anywhere close to it. But it will be a lot of fun to see them try.